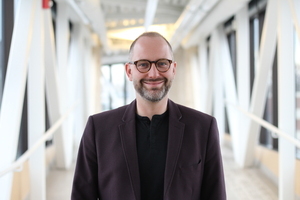 James Magnus-Johnston, Director of the Centre for Resilience and Instructor of Social Entrepreneurship, has taught at CMU since 2013. In my work as an instructor, I love that we can read and contemplate together with students and colleagues. Being able to sit with ideas and read things together is such a privilege. At the centre, I love that we can have a real impact on important social and ecological challenges. The Social Innovation Lab. The Social Innovation Lab is the course that plugs into the work of the Centre for Resilience, in which students design, propose, and test a solution to a problem posed by a community organization or business. Students explore all the pitfalls of working in teams with many different people and organizations, sometimes with competing interests. I find a lot of joy in helping them navigate those challenges. Buddha's Brain: The Practical Neuroscience of Happiness, Love and Wisdom by Rick Hanson. I've read a number of books about neuroscience recently. It's really interesting and helpful, indirectly, to some of the things that we are working on out of the centre. Students challenge me, and that's why they give me hope. I'll give them a provocative idea to think about and then ask, what are the limits of this idea? Every once in awhile, someone responds by saying, "Well that's a dumb idea," but of course that's such an easy, knee-jerk response without much careful thought, and that's why much of society has such a hard time managing political discourse right now—we write each other off. What I find promising in conversations with students is how we allow ourselves to get beyond those walls and knee-jerk responses. Someone recently suggested to me that CMU has characteristics of gentleness and creativity, and I think that when we can nurture these characteristics, we can have better conversations. I long for a peaceful and reasonable society embodying all the highest ideals of the Enlightenment, which is perhaps a sad kind of longing, but right now, I actually worry that these ideals are in danger. When I'm teaching courses, particularly in the realm of political studies, we spend time negotiating the limits between fringe ideas and mainstream ideas which embody a civil, peaceful, reasonable, rational—to the extent that we can be—society. One where we consider better ways of taking care of one another and the world around us. What saying or motto inspires you? There's a really lovely passage from the Japanese poet Kobayashi Issa that keeps popping up again and again which is: "This dewdrop world is but a dewdrop world. And yet, and yet..." It points to the fragility of this world and our interactions with each other, and yet also suggests that there's so much promise and there's so much joy. We need to remind ourselves to move in that direction sometimes.